What will I get when Purchasing a Flight Gift Certificate? Please be aware that flight dates have to be scheduled in advance. 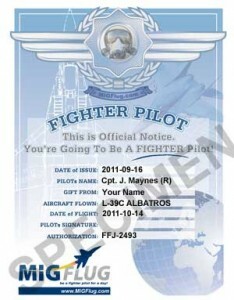 You can download, print and present the certificate immediately after purchase. The actual flight can be scheduled any time later. Our general terms are at all times applicable. Important: The form below will only reserve a flight if you complete the payment process. If you would like to inquire about flights without committing for payment, please contact us first (please allow 24 hours to get back to you). If you require the voucher immediately or have no further questions, please proceed by using the form below. What Options do I have when Buying a Flight Gift Certificate? Option 2 (Full Flight): You reserve a complete flight package. There is no additional payment required on the airfield. To choose this option, select any of the flight packages below (30 minutes flight, 45 minutes flight or one hour flight). The "Deposit" option entitles you for a flight within one year. With the deposit, you receive a gift certificate and value voucher. The rest of the flight price is to be settled on the day of flight on the airfield in cash or by cheque. The 30/45/60 minutes flight options include everything related to the flight, there is no cash payment required on the flight date. Each flight includes everything needed: all flight gear to use (flight, helmet, gloves if applicable), a flight instruction, security briefing, admission to the airfield. Flight date upon individual appointment, usually all days possible. We have the possibility to record in-flight movies as a nice souvenir of your flight. These are high-quality, wide-angle HD movies. The movie will be given to you right after the flight as an electronic file in MP4 format. This is the price for the flight and options you chose. Please enter your credit card information below to settle the payment and order your flight gift certificate. This Form allows you to directly purchase a flight Gift Certificate by either paying parts or the complete fee for a flight. To complete the form, a credit card payment is required.